Mark your calendars for an astronomical event that you don’t want to miss. In the early morning of Sunday, November 9, most of the Western Hemisphere and Europe will be treated to a total lunar eclipse. And Universe Today is going to be gathering together a network of astrocameras, so you can watch it on the Internet if the weather doesn’t cooperate for you. First a little background. Lunar eclipses happen once or twice a year when the Moon, Earth and Sun are lined up so well that the Moon passes into the Earth’s shadow. Over the course of a few hours, the Moon darkens, until it’s fully obscured and then turns a deep red colour. Unlike a solar eclipse, a lunar eclipse is perfectly safe to watch with your unprotected eyes; it’s no brighter than looking at the full Moon. The eclipse will begin on November 8 at 2215 GMT, but the Moon won’t actually seem any darker until about an hour later. It’ll be fully obscured on November 9 at 0119 GMT, and then brighten again by 0305 GMT. The whole event will be visible to people in the Americas, Europe and Africa, but not at all visible to Asia and Australia. For people on the West Coast of the Americas, the eclipse will have already begun when the Moon rises above the horizon, and for people closer to Asia, the Moon will be set before the eclipse is complete. For example, in Seattle, Washington, the Moon will already be 13% eclipsed when it rises. As usual, Universe Today will be showcasing astrocameras from around the area providing coverage of the eclipse. If you’re outside the visible area, or the weather doesn’t cooperate for you (November in Vancouver = rain), then you can enjoy it live from the comfort of your computer. If you’d like to get involved, please send me an email at [email protected]. This will be the second lunar eclipse for 2003; the first happened back in May, and was visible from similar regions on the Earth. 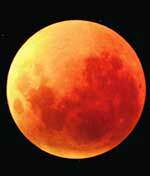 The next total lunar eclipse will be visible from Europe and Asia on May 4, 2004.